What is collimation anyway? Simply put collimation is the process of aligning the focuser, secondary, and primary mirrors (lenses, mirrors, prisms, eyepieces) in their proper positions. For a Newtonian reflector telescope to achieve crisp and well focused views of planets and other heavenly bodies all of the mentioned components have to be accurately aligned with each other. For a beginner this can be no small task. There are many websites on the Internet that explain step by step how to collimate your telescope. One that I found to be very helpful was FAQ about Collimating a Newtonian telescope by Nils Olof Carlin. This site goes into detail concerning the different sorts of errors that occur when any one of the above mentioned components is misaligned. Most of the material in the site went over my head, but I was able to understand the steps needed for collimating my own telescope. This is a picture of what you will see when looking down the focus tube of your telescope. Now, one very important tool which you will absolutely need is a peephole. Relax, you can make one out of a 35mm canister. 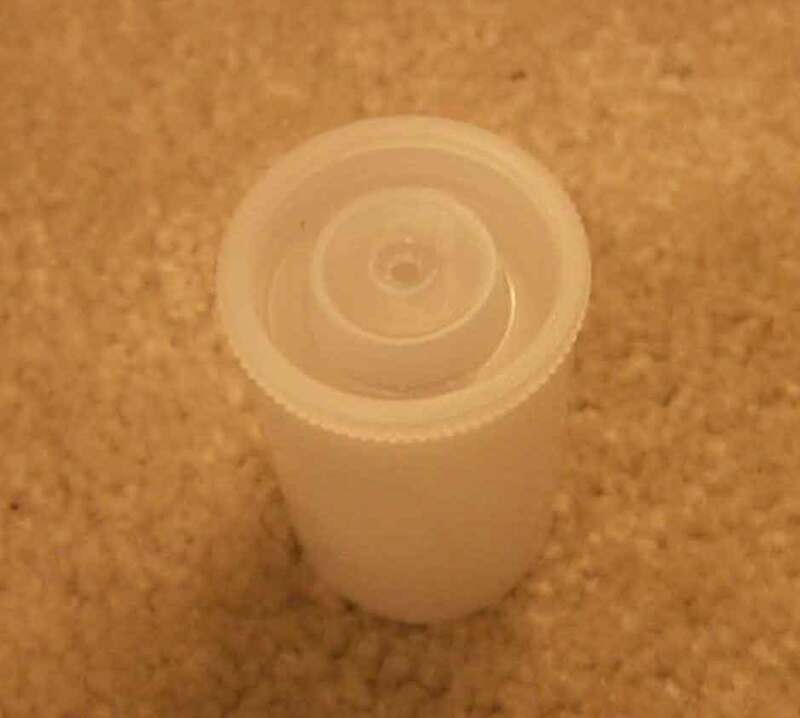 You will need to cut out the bottom of the canister and drill a hole about 2-5mm in diameter in the exact center of the canisters cap. To the right is a picture of the peephole I use. The canister is just the correct diameter and will fit nicely into the focus tube. The purpose of the peephole is to ensure that you are looking directly down the center of the focus tube (this is very important). Looking down the focus tube with the peephole in place you will be able to see the following; the focus tube, the secondary mirror along with the secondary mirror holder and clip, the reflection of the main mirror, the spider vanes, and finally the reflection of the secondary mirror. At this point what you are looking for is that the secondary mirror is perfectly centered underneath the focus tube. Don’t worry about what or what you can’t see on the secondary mirror at this point, just concentrate on ensuring that the actual secondary mirror is physically centered in respect to the focus tube. 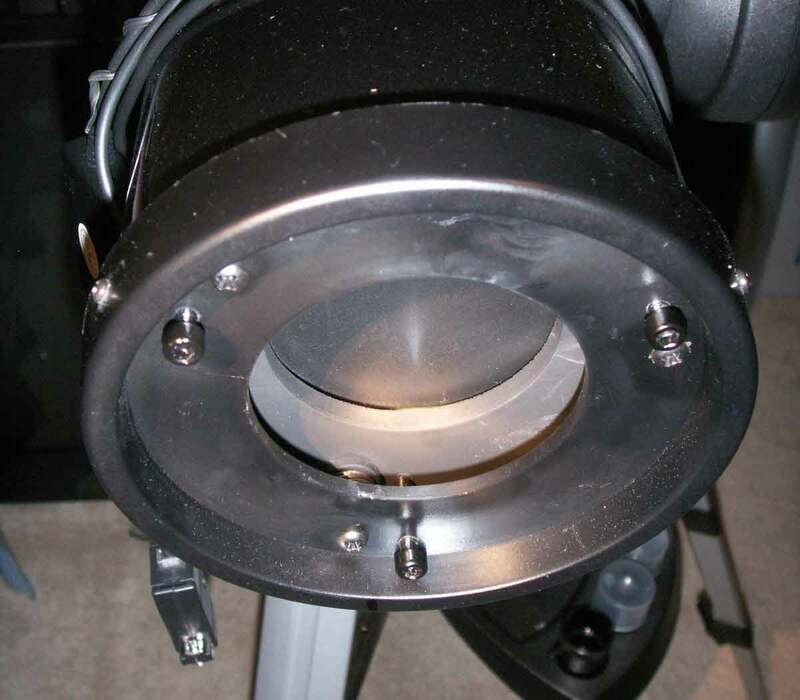 If the secondary mirror is off to the left or right of center you will need to adjust the spider vane screws on the outside of the telescope tube to bring the mirror assembly back to center. Be sure to unscrew one vane screw while screwing in the other. If the secondary mirror is too far in or out of the tube you will need to loosen the set screws on the secondary mirror assembly (usually three) and then either screw in or out the center screw which holds the secondary mirror in place. This process should bring the secondary mirror directly underneath the focus tube. I like to rack the focuser in to the point where the secondary mirror just covers the focus tube opening. In this way you will be able to make fine adjustments until everything looks symmetric. The focus tube itself could be badly misaligned and might need to be centered, although this was not the case with my telescope. Just check the focus tube to be sure it isn’t grossly out of place. If you are having a hard time seeing the sides of the secondary mirror for making the fine adjustments here is a trick that has helped me. Take two different colored pieces of paper. I used cardstock as it is not so flimsy. Cut a piece and slide it behind the secondary mirror along the OTA so it sits directly behind your field of view when looking down the focuser. Now cut a different colored piece and stand it up between the secondary and primary mirror so it is blocking your view of the primary mirror. Now point the OTA at a bright source of light. Now when you look down the focuser you will see the bright colors outlining the secondary mirror making fine adjustments easier. The next step is to center the main mirror’s reflection on the secondary mirror. To accomplish this you will turn your attention to the three set screws on the center of the spider assembly directly behind the secondary mirror. While looking down the peephole, loosen these three screws and tilt the secondary mirror until you are able to see the entire main mirror on the secondary mirror. Lightly tighten the set screws and proceed to make fine adjustments to them until you are confident that the main mirror’s reflection is perfectly centered on the secondary mirror. After this step you might need to go back and ensure that the secondary mirror is still centered underneath the focus tube. If not, adjust the spider vane screws again and check that the main mirror is still centered on the secondary mirror. Do these two steps until everything looks perfect. The next step is to adjust the main mirror. Here is where a spot on the center of the main mirror comes in very handy. I made the center spot on my telescope’s main mirror by first taking the entire main mirror assembly off. I then took a few measurements of the main mirror, and with a compass I drew a circle on a piece of paper of the same diameter as the main mirror. I cut the circle out with scissors and folded it in half and then in half again. I then cut out a small piece from the tip of the folded paper. Once I unfolded the paper I placed it on top of the main mirror, and with a red marker I made a very small mark in the center of the paper were I had cut out a hole earlier. Now I had a spot in the exact center of the main mirror. I then took a circular paper reinforcement ring and placed it around the center spot. Don’t worry about putting something in the center of the main mirror as this area of the mirror is not utilized for viewing due to the fact that it is always in the shadow of the secondary mirror assembly. Many telescopes already come with the center spot from the factory saving you this step.Once the main mirror with the center spot is put back in place on the telescope you can use the peephole as a rudimentary Cheshire. Basically, what you want to do is take a flashlight and shine it over the peephole which in my case is somewhat transparent. 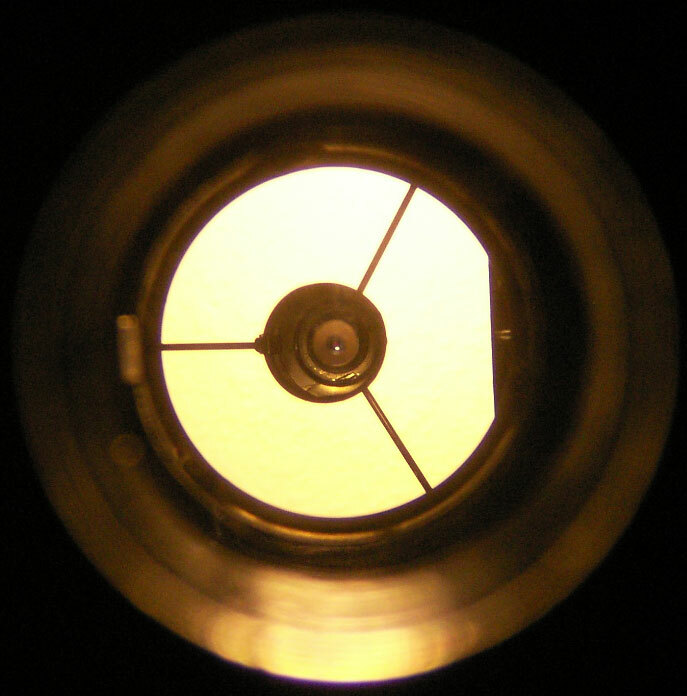 If you look down the peephole you should see the center spot on the main mirror, and a ring of light around it due to the flashlight shining through the peephole. Most likely the center spot will not be in the center of the peephole, so adjustment to the main mirror will be necessary. The main mirror assembly normally has three set screws and three lock screws. Unscrew the lock screws a bit, and then screw in or out one set screw at a time until you get an idea of what each screw does with respect to the center spot. The goal is to adjust the set screws until the center spot is perfectly centered within the peephole. In my case the paper reinforcement ring is just smaller than the peephole, so when the flash light shines down the peephole I can adjust the main mirror until I end up with a perfectly spaced light ring round the center spot. At this point your telescope should be collimated. The ultimate test is to point the telescope at a distant star using an eyepiece one to two times the power of your aperture value. Be sure that the star is perfectly centered in the eyepiece and then rack the focuser in and out of focus. When the star is out of focus you should be able to see the shadow of the secondary assembly and the spider vanes. The shadow of the secondary assembly should be centered within the light circle created by the star. If it’s not, you will need to adjust the main mirror set screws in the direction of the dissymmetry. The adjustments needed at this point will be very minute so be careful not to over do them. 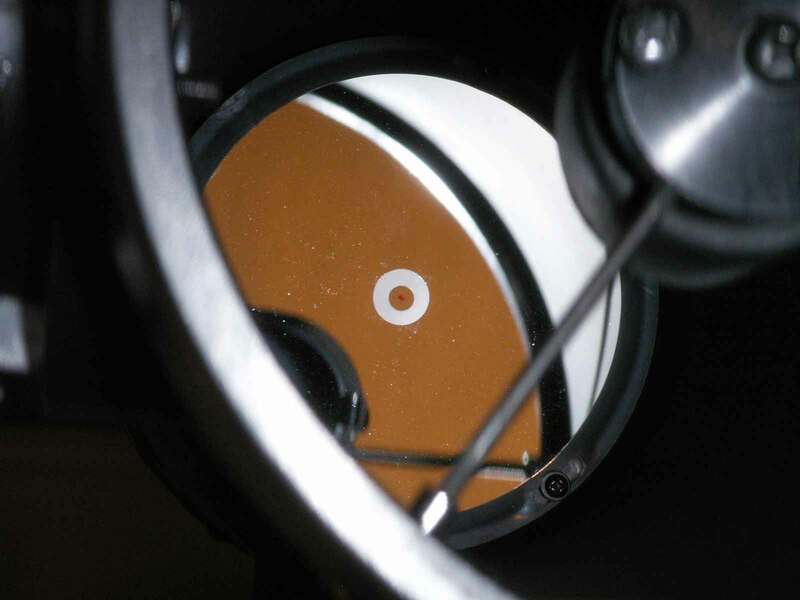 It is possible to use a laser collimator to assist in the collimation of the primary mirror. I purchased an inexpensive one online and it has worked very well for me so far. I want to stress that you should only use a laser collimator for adjusting the primary mirror NOT the secondary mirror. In my experience using a laser collimator for adjusting the secondary mirror is a complete waste of time as it is very difficult to place the laser in just the correct location on the focuser to achieve good alignment of the secondary. Use the visual approach to aligning the secondary. 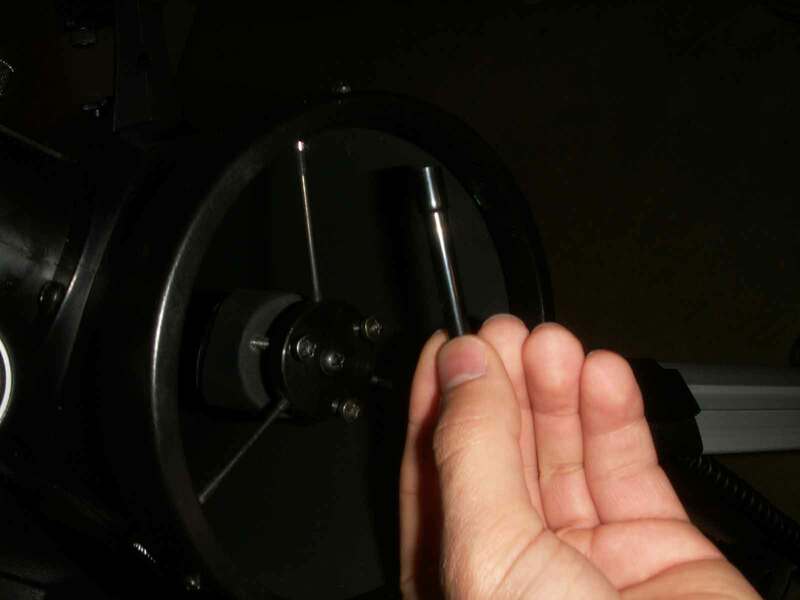 The trick to good primary collimation using a laser collimator is to use a Barlow lens in conjunction with it. I have taken an image of my laser collimator and Barlow lens combo. The purpose of the Barlow is to defuse the laser light source from a point of light to a more broad light beam. This light beam will be larger than the center spot on your primary and in turn will generate a shadow when the light is reflected back onto the target on the laser collimator. 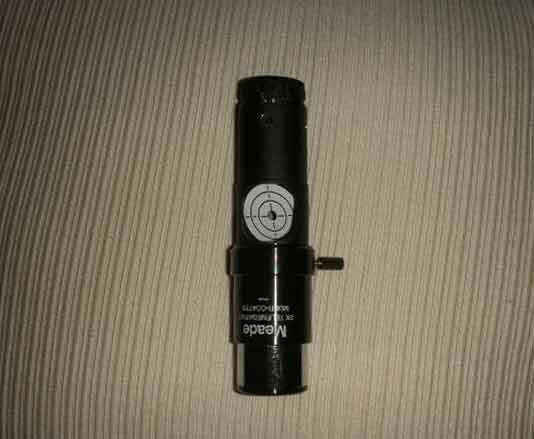 This round shadow is what you will use to perfectly center on the laser collimators target by adjusting the set screws on the primary mirror. I was amazed at how well this technique worked when I first tried it! I found this trick while searching on YouTube and it really does works. Collimating your telescope doesn’t have to be a nightmare. In the process of collimating my telescope I learned how it was designed, how to take it apart, and how to put it back together. Frankly, I feel much more comfortable working with my telescope now. At first I did not feel comfortable at all with taking the main mirror out and putting a center spot on it, or taking the spider assembly apart. Nevertheless, I had to do these things to correctly collimate the telescope, and I am glad now that I mustered up enough courage to take the thing apart and get the job done. The crisp, well focused images which I am now getting from my telescope makes all of this hard work worthwhile. I’ve ‘refound’ your site a number of times, as I learn more about ‘amateur astronomy’ & repeatedly found value here. Yet, I’m confused; You wrote; “using an eyepiece one to two times the power of your aperture value”. I’m considered to be a ‘newbie’ so I don’t understand what that means. Just guessing, I’m wondering if you meant using an eyepiece that yields a power equal to “one or two times … the aperture”, or, as Nils Olof Carlin wrote, “use a magnification of 1-2x per mm of aperture”, which for a 6″ ‘scope would be about 5mm focal length eyepiece. I assume. Please help me to understand this very important subject. Many ‘Thanks’ for your help, & many more “Thanks” in advance for helping me understand this. Hi Jon, you are correct. A 5mm eyepiece should work fine for this purpose. Nils’ write up on this subject is excellent and I’ve used it in the past as well. In my experience of using this technique though it was hard to see the diffraction rings and even harder to adjust the primary at the same time. If you aren’t doing planetary imaging which DOES require precise collimating, then the laser collimating technique works well and is much simpler. Nevertheless, I’d experiment with this technique as it might work well with your setup.